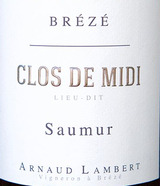 Clos du Midi's aromas are discrete expressions of honey, dried exotic fruits, herbal tea and sweet lemon. Although this wine is 100% Chenin Blanc, it bears the freshness of a young Sancerre, the soft richness of Chabis, but with the unmistakable charm of Chenin Blanc. It's a stunner!